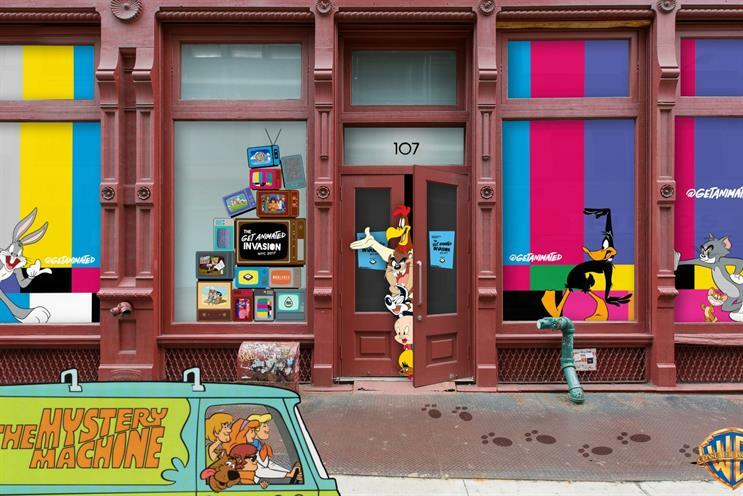 Bugs Bunny, Scooby-Doo and several other Warner Bros characters are set to feature in a pop-up for New York Comic Con. The "Get animated invasion" activation will have interactive and photogenic installations around each cartoon realm. This includes Bugs Bunny's forest, Wile E Coyote's cliff, the iconic Warner Bros water tower, a Jetsons’ screening room, Scooby-Doo’s spooky woods, Bedrock from The Flintstones and the house in Tom and Jerry. The event, which runs from 6 to 8 October will also have special ice cream cereal treats as part of The Flinstones experience. It aims to "blur the lines between art, content and commerce". The entertainment company’s consumer products division has teamed up with Boomerang, the premium video streaming service launched through a partnership between Time Warner’s Turner and Warner Bros, and pop-culture retailer BoxLunch to put on the experience. The activity is part of Warner Bros Consumer Product’s "Get animated" campaign which encourages fans to engage with their favourite cartoon characters. Pam Lifford, president of Warner Bros consumer products, said: "We’re excited for fans to experience this new creative way to step into the world of their favorite animated character. The 'Get animated invasion' pushes the boundaries of fan engagement, blurring the lines between art, content and commerce."